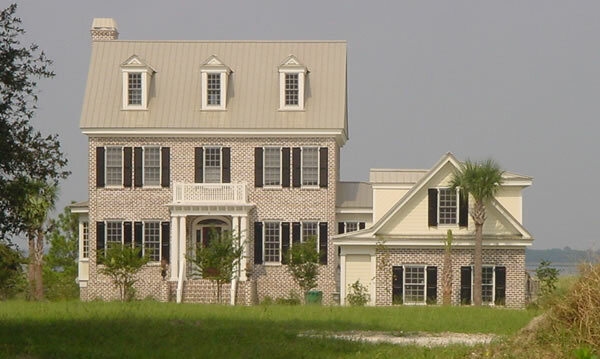 As you probably know by now, three story house plans are quite rare. From the covered entry porch of this unique home, you enter a formal foyer with arched openings leading to the surrounding rooms. To the right is a formal dining room, with a door that provides easy access to the kitchen. 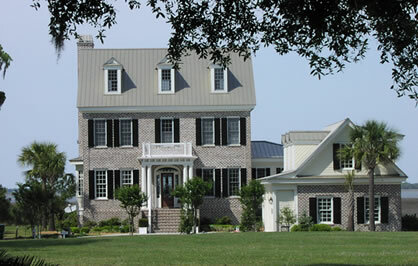 To the left, pocket doors open to a study with a coffered ceiling, and large bay windows with window seats on the far side. And straight ahead, as you walk toward the main living areas at the rear of the house, you pass the stairway, a small hall that divides the dining room from the kitchen, a powder room, and an optional elevator. The spacious great room also features a coffered ceiling, along with a central hearth flanked by windows that faces the open kitchen area as well. Windows and a pair of French doors line the entire rear wall, allowing an abundance of natural light in from and views out to the rear porch, which also runs the full width of the house. The great room, kitchen and breakfast area are completely open to each other. The kitchen is quite large, and it includes a center work island with a conveniently located prep sink. 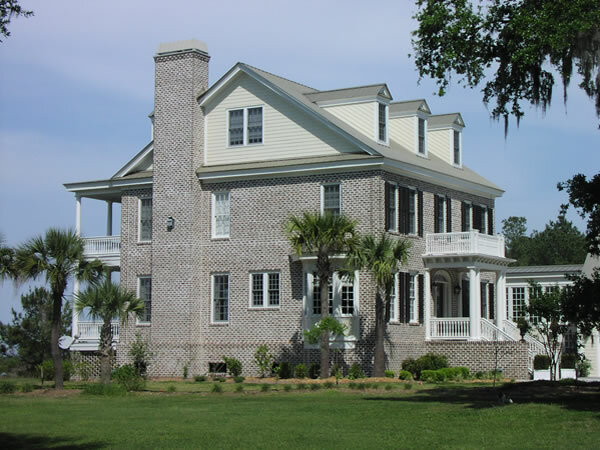 A door in the corner of the kitchen opens to a screened porch with its own grill, counters and sink for easy outdoor dining, and another door leads to a large area that includes a walk–in pantry, space for an office desk, a laundry room, an extra refrigerator or freezer, and a full bath. A hallway off the laundry area leads to a 3–car garage, but it can be easily eliminated if you prefer a detached garage. The ceilings throughout the main level are 11' high. On the second level you'll find three roomy bedrooms and the master suite. The master bedroom features a large fireplace, and a 10'–deep covered deck that spans the entire width of the house. The master bath has a tub and a separate shower, two vanity sinks, a private toilet room, and a large walk–in closet. Bedrooms 2 and 4 share a full bath, while Bedroom 3 has its own private full bath. A closet off of the hall accommodates another washer and dryer for added convenience. 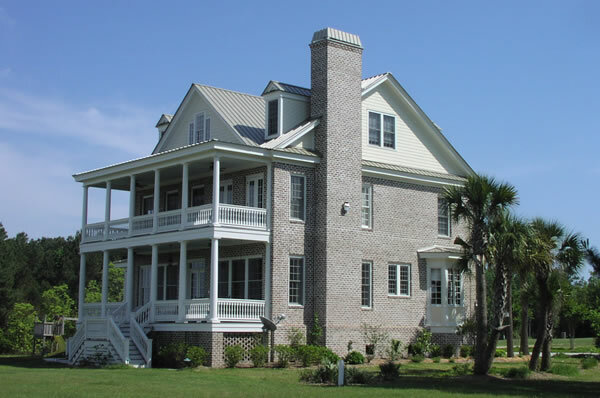 The third level loft has dormers along the front and rear, which adds additional height to the sloped ceilings, and allows windows for light and ventilation. There is room for a bedroom, a full bath, and an open area for a potential office or recreation room. Due to the site conditions of the original house, there is a hallway with steps down to the three–car garage. 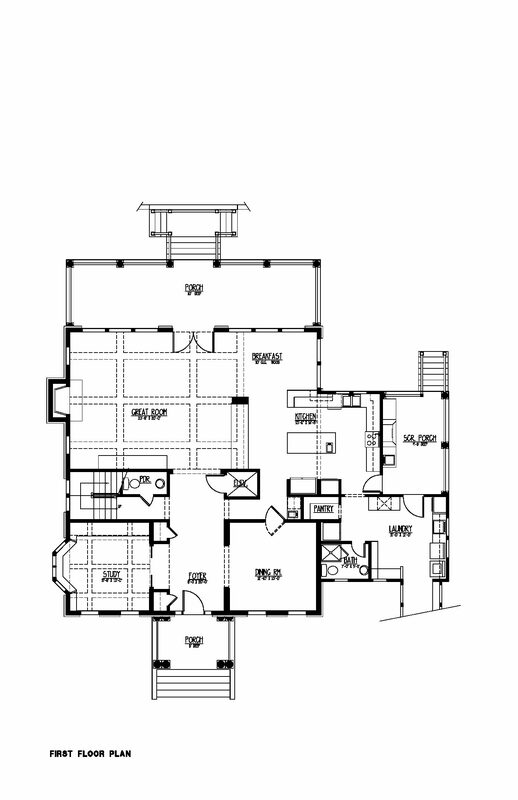 The garage has a second level with a bedroom, a full bath, a kitchenette, and a living space. 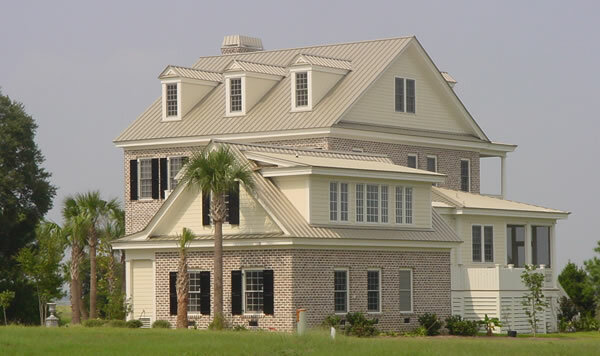 Three dormers along one side allow additional head height in the sloped ceilings. 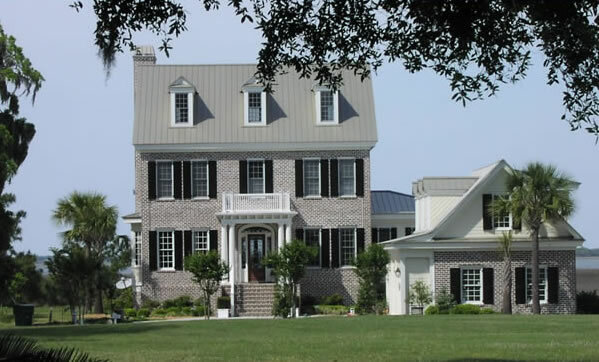 This handsome southern home is reminiscent of the traditional Colonial style, with its classic formal entry porch, multi–paned windows throughout, brick exterior (although this is of course one of many options), and dormers at the front and rear to provide additional space on the third level. The home has a semi–attached three–car garage with an in–law unit above, which can easily be built as a detached garage if this works better on your site.